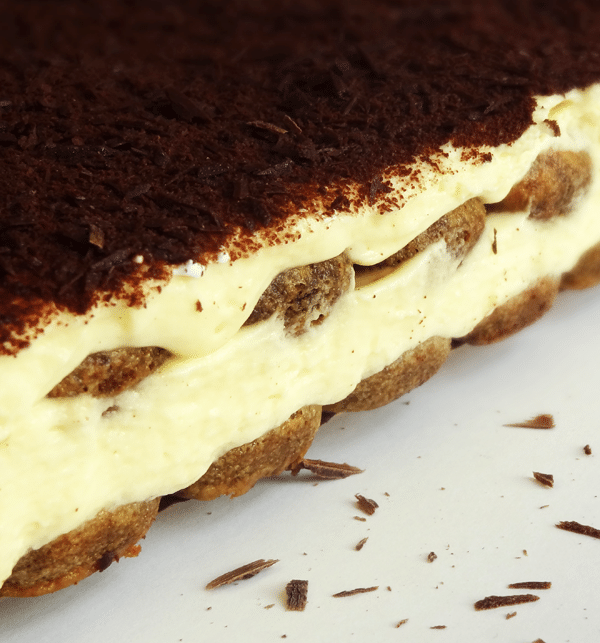 This classic tiramisu recipe is fan-freaking-tastic. No joke. An easy, classic Italian recipe, if you haven’t made tiramisu before now’s the time! I’d never really considered myself a tiramisu fan before. I had a friend in high school who loved it, so I’d eat it with her. I’ve tried my share, usually at restaurants, but I’d never made it. I was in the indifferent category and it seemed a little scary to make. Well thank goodness my co-worker requested it one day. I am officially a BIG fan of this homemade tiramisu. When I set out to make tiramisu, I figured if I was going to do it, I had to do it right. So I got the real deal ladyfingers and mascarpone cheese and went for it. I learned that making it isn’t actually that scary. In fact, it’s fairly simple. And totally worth it. Plus, you don’t have to turn on your oven. Sure the stove is involved, but that seems easier to me. Start off by combining the egg yolks and sugar in the top of a double boiler (or in my case, my metal mixer bowl), over boiling water and cook for about 10 minutes. It’s hard to screw this part up. Just boil the water, combine the egg yolks and sugar, then cook 10 minutes. When done, whip the yolks with your mixer until they start to thicken and yellow. It’s not like they get bright yellow, but they will become a little yellow-er. Then add the mascarpone cheese. At this point I transfer the mixture to another bowl, because I need my metal mixer bowl again. If you have 2 metal bowls for your stand mixer, I’m jealous. Of course you can make this dessert with a hand mixer as well, but I do love my stand mixer. Just turn it on and walk away. Best invention ever. Next, you’re going to make the whipped cream. The first time I made this tiramisu was the first time I’d ever made homemade whipped cream. I was terrified. I think this was what I was most afraid of. How in the world can a liquid turn into the solid-ish state that is whipped cream without anything else being added?? Is it magic? Maybe. But whatever it is, it works. And SO effortlessly. Blew my mind. Put your bowl and whisk in the freezer for about 15-20 minutes. You want them really cold. Like, your tongue sticking to the ski lift in ‘Dumb and Dumber’ cold. Then you add the whipping cream and whisk away until it thickens, usually 5-7 minutes. That’s it! Fold it into the mascarpone mixture and set aside. That is, if you can keep your fingers out of it. SO yummy! Seriously, I think this is part of what makes this tiramisu so good. I don’t know why it’s so much better than any other I’ve had, but this stuff could be eaten on its own. Yummy with a capital Y. The rest is just layering. It can take a bit of time to dip all the ladyfingers, but it’s easy peasy. Just mix together some warm water, espresso and Kahlua. I went a little off the beaten path here, just so you know. You could up the expresso factor and take down the Kahlua factor if you want, but I have to say I LOVED the Kahlua in it. But as a warning, a couple co-workers were concerned they may end up drunk after one piece. 🙂 Like I said, you can cut it back if you want, just add more water and expresso. Dip each ladyfinger for about 4-6 seconds. The longer you dunk it, the more liquid it will absorb, therefore the stronger the coffee/Kahlua flavor. 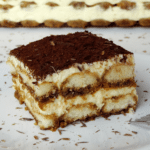 This recipe has two layers of ladyfingers and two layers of mascarpone mixture. Once you’re done layering, sprinkle some cocoa on top and maybe some chocolate shavings. Refrigerate overnight and enjoy! 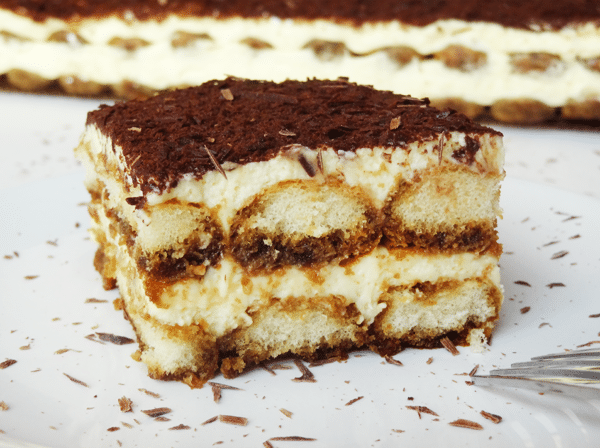 This classic tiramisu recipe is fan-freaking-tastic. No joke. 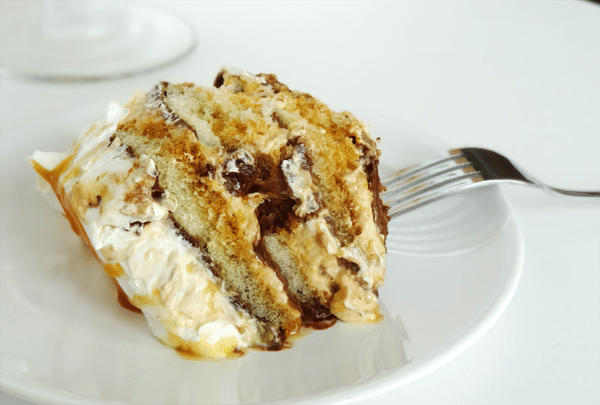 If you’ve always wanted to make tiramisu then this easy recipe is what you’re looking for! 1. Prepare a 9×13 baking dish. If you want to be able to remove the tiramisu from the pan when done so that you can see the layers, I suggest lining the pan with parchment paper that sticks up over the sides, then putting a cardboard cake rectangle in the bottom of the pan. The tiramisu will be supported by the cardboard when you remove it using the parchment paper. 2. Combine egg yolks and sugar in the top of a double boiler, over boiling water. If you don’t have a double boiler, you can use a metal mixing bowl set over a pot. 3. Cook for about 10 minutes, with heat on low, stirring constantly. 4. When done, whip yolks with mixer until they thicken and yellow a bit. 5. Add mascarpone to whipped yolks and mix until combined. 6. If you have a second metal mixing bowl, use it for your whipped cream. If not, put mascarpone mixture into another bowl and get your metal mixer bowl clean. 7. Add whipping cream to bowl and whip with mixer. Whip until soft peaks form, about 5-7 minutes. 8. Fold whipped cream into mascarpone mixture. 9. Dissolve espresso into warm water, then combine with the Kahlua. 10. One at a time, dip the ladyfingers into the Kahlua mixture for about 4-6 seconds. The longer you dip the ladyfingers, the stronger the flavor will be. As you dip the ladyfingers, lay them into the bottom of the 9×13 pan. You should be able to get two rows in a layer. 11. Spoon half of the mascarpone mixture over the ladyfingers. 12. Repeat ladyfinger layer, then top with remaining mascarpone mixture. 13. Dust the top with cocoa powder. 14. Refrigerate for several hours or overnight, then remove from pan (if desired) and serve. If you prefer a less strong (in terms of alcohol content) tiramisu, then reduce the amount of Kahlua and add more water and espresso. This post linked to This Gal Cooks, Lady Behind The Curtain, Living Well Spending Less, Lamberts Lately, Shaken Together, Skip To My Lou, Tidy Mom, Flour Me With Love, What’s Cooking Love?, I Should Be Mopping The Floor, Kitchen Meets Girl, Say Not Sweet Anne, Simply Sweet Home, Simple Living and Eating, The Mandatory Mooch, Recipes For My Boys, Ginger Snap Crafts and Hungry Little Girl. Wow, this looks awesome! I pinned it and can’t wait to try it. Thanks Angie, I hope you like it! Thank you for sharing! I grew up eating tiramisu and yours looks so firm and delicious. Thanks for sharing it with us on foodie friday. Thank you Diane! And thank you for the party! Hi! I’m in the middle of making the classic tiramisu. I was wondering if by espresso you mean already made espresso or just the powder? If you could get back to me, that would be great! Thanks. Hi Melissa! It’s espresso granules. You’ll see in the instructions that you add it to warm water to get espresso for drizzling. I hope you enjoy it, it’s one of my favorites! I made this last night and it was my very first time making tiramisu. Your recipe was so easy to follow and it turned out awesome! I used less Kahlua (1 cup) and used 4 shots of espresso made from my home espresso machine and it was just enough to soak the ladyfingers (and still enough to get a buzz off one slice.) Boyfriend and roommates licked their plates clean, lol. Thank you so much for this recipe, definitely will recommend!! I can’t have any alcohol. (Sad face) Do you think I could substitute chocolate milk for the Kahlua? Certainly you could. It might give it a bit of a milky taste. You could also try a little more espresso and water it down to get enough liquid. This looks like the perfect dessert to end a classic Italian meal we have planned for friends. (The Kahlua put it over the top for me 🙂 Did you use the softer ladyfingers or the crunchy type? Thanks so much! The Kahlua is totally necessary. 🙂 I use the crunchy ones. Thanks! Can’t wait to give it a try this weekend! Made this today and HAD to try a piece before serving it to guests tomorrow 🙂 Oh my goodness!!! Fan-freaking-tastic indeed! Thanks for convincing me to try my hand at making this classic dessert. I’m so glad you tried it! And so glad it was a hit too! 🙂 Thanks Joni! I also cannot have alcohol, so i was just going to make this with the espresso/water. how much water do you think i need for it to be a sufficient amount for the lady fingers? you mentioned “add more water and espresso” but i have never used instant espresso before, and dont want to mess it up! thanks for your help in advance. I haven’t done it without Kahlua before, so I can’t say for sure. You’ll want to make sure the espresso isn’t too strong. A lot of liquid ends up soaked into the lady fingers, so you’ll probably want to add about 1 1/2 to 2 cups of water in place of the Kahlua. For the espresso, you’ll probably want to double or triple the amount used. Then taste a little bit of it and see if you think it should be stronger. I hope that helps. Tirsmisu is our fav desert… I am planning to make it for our anniversary and I only have the softer lady fingers… Do u think that they would work?? Hmmm, I’m not sure that it would turn out as well. The regular ones are dryer and soak up the liquid, you might want to reduce the liquid if you use the soft ones. Here’s a link to a tiramisu trifle I made with the softer lady fingers if you’d rather try that. The recipe looks awesome. I’m going to make it for my husband’s Birthday. This Tiramisu recipe is the best one I’ve ever made. Honestly, I’ve made it so many times now and it never fails. Thank you! They irritate me too Barry. Thank you! Recipe looks wonderful. 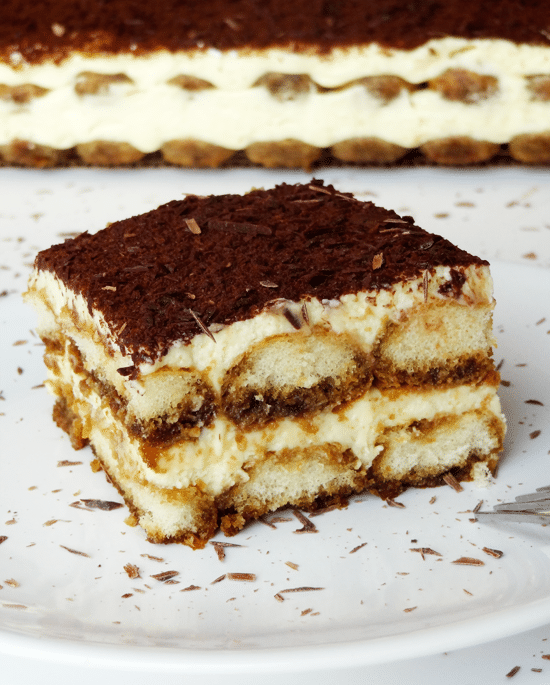 Do you use soft lady fingers and do you split them to assemble the Tiramisu? Will this filling fill up a 9×13 dish with 2 layers? If possible, please respond to my email address: [email protected] I wish to make this recipe before May 15th, 2016. I use the traditional firm lady fingers, so they aren’t split. Yes, it’s made in an full size 9×13 pan. I hope you enjoy it! What cocoa powder do you recommend? Is it the Hershey unsweetened? I love how the egg and sugar mixture are cooked before adding it to the cheese and whipped cream. Eggs are raw in some recipes of tiramisu that I have seen. Yes, natural unsweetened cocoa powder. I made the tiramisu cake today. It was tasty, but the cream consistency wasn’t right. The sabayon sauce should be refrigerated before adding it to the whipped cream. I also added a little vanilla extract to the cream. Thanks for sharing this recipe I can wait to try it. I have never even seen Crunchy ladyfingers. Where would I find them. I have only ever seen soft ladyfingers. 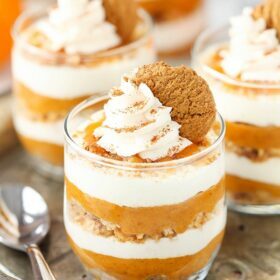 I want to use this recipe (sounds delicious) so please, has anyone used the soft ladyfingers and how did it turn out.Thank you for your help. Ps What is Suki talking about (sabayon sauce), what is that? The crunchy/dry ones are the more traditional lady fingers. I usually find them at a little Italian market, but I saw them just yesterday at Kroger (a grocery store in our area). You can buy them on amazon too. I don’t know what sabayon sauce is. I didn’t use any in this tiramisu. The Italian term is zabaglione. I usually strain my mixture to be on the safe side to ensure it’s creamy and no lumps. they are called biscotti ladyfinger, works great!! What can I use to substitute the ladyfingers since I don’t like them? I guess you’ll have to get creative! 🙂 One option would be to use a vanilla cookie of some kind. A shortbread would probably be firm enough and hold up well. You could also make a different kind of tiramisu dessert. These tiramisu cupcakes are a great option – it has all the great parts of tiramisu in cupcake form, so no ladyfingers. For something a little different, there’s this Oreo Brookie Tiramisu. Similar idea to a traditional tiramisu, but with brownies and cookies in place of ladyfingers. I hope that helps! Hi I was wondering how long does this need to be refrigerated if wanting to use it same day as you make it? I will realisitcally probably only have around 3 hours for refrigeration time, would that work? I usually make it a day ahead. I don’t think I’ve only refrigerated it for 3 hours. It may be softer, but it should be ok.
What kind and where do you buy the espresso granuals?? I find them on the coffee aisle in the grocery store. It’s like instant coffee, but instant espresso. Do you submerge the lady finger completely under the liquid? Ex: is the entire ladyfinger to be soaked or jus the bottom half? Yes, submerge the whole thing. Is it better to make 2 days before or the morning before serving if it isn’t possible to make the day before? I’d probably go with the morning of, but 2 days before should be ok. I would like to make this in a 9×13. Should I double it? This is actually made as a 9×13 already. I just made this Tiramisu and it was delicious and enjoyed by everyone at my daughter’s birthday. I made it with the soft lady fingers and I must say I had my doubts but it worked great. I even prepared it two days earlier. This recipe is definitely a keeper ! I made the recipe exactly as it said but it had an overwhelming Kahlua taste. It honestly tasted like pure alcohol! I used the softer lady fingers instead of the firmer ones but besides that, everything else was done just as the recipe said. Did anyone else have this same problem? I would say that the firmer lady fingers might make a bit of a difference. 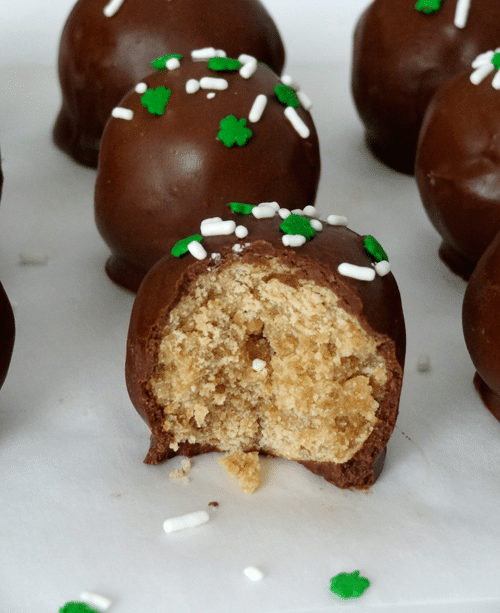 However you are right that this recipe has a stronger Kahlua flavor than some others. I personally like the strong flavor, but you could definitely replace some of the Kahlua with additional espresso. Thank you, thank you for this! Now that I know how good your tasters are, I will follow and try it all of your recipe’s!! I did ease up on the Kalua but you must increase the rest so you have enough liquid. I totally trust your recipes, You are my first, LOL EXCELLENT JOB!!! I’m so glad to hear that! Thanks Pamela! Help!!! My sugar and egg yolks is thick and grainy like a paste!! This cannot be right! What could I have done wrong?? Did you cook them for too long? At what point in the instructions were you when they ended up like a paste? They should be fine when cooked over the stove – just keep them on a low enough heat setting with the double boiler so that the eggs don’t cook too quickly and scramble. I cant wait to try this recipe… however i would like to put something bright and colourful on the plate when i serve it to my guests…. would any type of fruit go well with this? A fresh pop of berries would look great! I would recommend strawberries or raspberries. Thank you Lindsay… Raspberries worked well with it..
it was an absolutly stunning dessert and i got loads of comments on it! 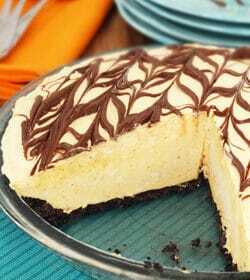 Best recipe:):):) cant wait to try some more of yours now! That sounds like it’s fine. The whipped cream does help it thicken. Holy cow this was delicious!! Huge hit with the family! Keeping this saved for the future for sure! Thank you! Hello! I just finished making this recipe for the third time and it’s absolutely delicious. However, this time I noticed my cream wasn’t as thick as it usually is. It was a tad bit runny. I whipped the heavy cream till soft peaks formed and once I added the egg/marscapone mixture it loosened a bit . It tastes great but I’m just worried it won’t thicken. Will it thicken overnight in the refrigerator? It’s hard for me to say from a distance, but it might. I hope it turned out ok! 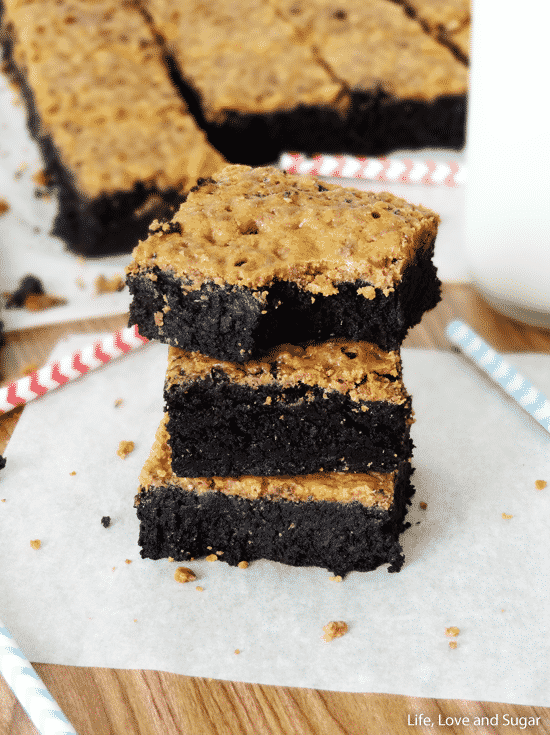 Sprinkling the top with cocoa powder…….the unsweetened cocoa powder? Yes, I used natural unsweetened cocoa powder. Made this last night and it turned out amazing! Made a two slight adjustments… strained the egg yoke mixture because I could not get the sugar to melt and didn’t want to over cook the custard and wanted to remove any cooked egg and I used less alcohol and more espresso. I let it set overnight and cut perfectly and came out of the glass dish perfectly! Can I bake this in a circular cake pan? As long as the pan is big enough to hold everything, it should be fine.